Getting close to the end of these reviews, just this one big book, and a smaller bonus supplement. Exploits is basically the rule book of Dungeon Fantasy RPG, it tells you all the cool things characters can do and how. Sometime's, as a shortcut, I might call it the GM's manual, but really, everyone benefits from reading it because it can be inspiring and intriguing to see the different things you are capable of doing. I remember the first time reading Dungeon Fantasy 2, one of the big sources of material in this book and seeing all the ways certain skills or advantages could be applied, and as a fairly new RPG gamer, it was really eye opening. Let's take a closer look at this book. Dungeon Fantasy - Exploits is a 114 page book, and along with Dungeon Fantasy - Adventurers makes up the core of the rules. Subtracting 18 pages of nice cover art, helpful cover inserts, table of contents, a full index, a short play example, some control sheets, and a tables appendix, we then have 96 pages relegated to the main content. Special note on the record sheets, the GM Control Sheet actually has a useful amount of space, as compared to others. I think a box for encumbrance would have also been helpful on the page, but that's a small fix, not major reconstructive surgery like most of the sheets in other supplements require. I also think the Wandering Monsters and Random Traps is pretty good, but might have been better if it devoted the entire page to just one set of encounters... 9 spaces on a roll table seems awkward, and if it were increased to 11 (to support all the possibilities on a 2d6 roll; 36 might also fit for every single combination, but would probably be even more snug than what we already have, or require the editorial moved off page) the rows could be made wider to accommodate slightly more detailed notes than the uncomfortably snug layout we have. The book is divided into 6 chapters, chapter 1, 8 pages, is a detailed overview of the dice rolling mechanics; chapter 2, 13 pages, are rules for town interactions, travelling and dungeon exploration; chapter 3, a whopping 33 pages, goes over the combat system; chapter 4, 13 pages, talks about injuries, sickness, curses, and how to treat them; chapter 5, 8 pages, talks about important concepts of treasure, like how delvers can identify rare magic or negotiate good prices; the final chapter, chapter 6 at 16 pages is advice for GMs to manage the game, to make it fun for the players, and make sure they have fun themselves. Well, anyway, for old timers, this book is somewhat analogous to GURPS - Campaigns and Dungeon Fantasy 2, with a smattering of useful bits from other resources. A handful of perhaps the more convoluted rules have been simplified for better or for worse (mostly better) Overall, I think its a good sublimation of the rules needed to run a Dungeon Fantasy RPG game. For brand new players and GMs, this is a guideline, but not the gospel truth, and GMs, are encouraged to color out of the lines if they read something they don't entirely agree with. It is though, as I mentioned, a really helpful resource if you are diving in head first, and have absolutely no bearing on where to go. 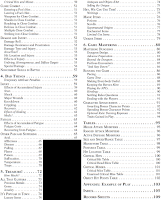 It's advice from some of the best GURPS books, with a lot of superfluous stuff taken out, to make a helpful, optimized manual that's even entertaining to read. This chapter talks about the mechanical usages of a character's traits and how to use them to the party's benefit. How does shoplifting work? How does crafting work? How do I hike? What if I want to follow someone sneaky like? How much do torches help? The chapter is really helpful, but the organization seems a bit lackadaisical; it is grouped into categories of "things you do in town" "things you do while travelling" and "things you do while in a dungeon" though with such a wide breadth of topics to cover, it feels a little bit more like an FAQ answering a bunch of random "but ok, how about [...]? And what about [...]? And when this happens?," albeit, they are really good questions. 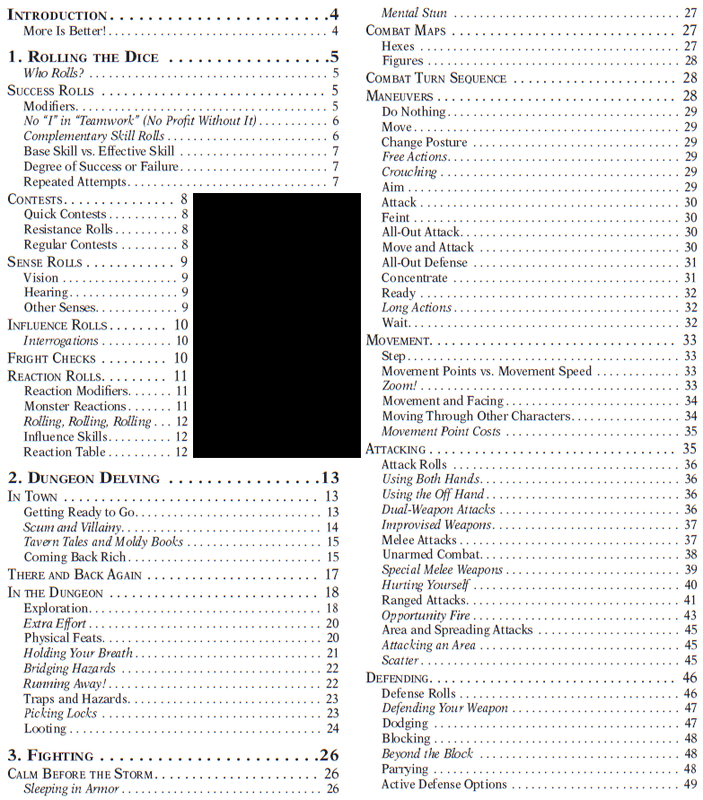 The chapter about the combat system. 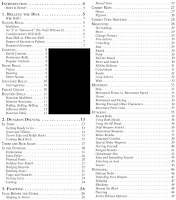 To GURPS veterans, this is mostly the "tactical" combat system, laced with special advice from Dungeon Fantasy 2 to take advantage of the different professional template's aptitudes. 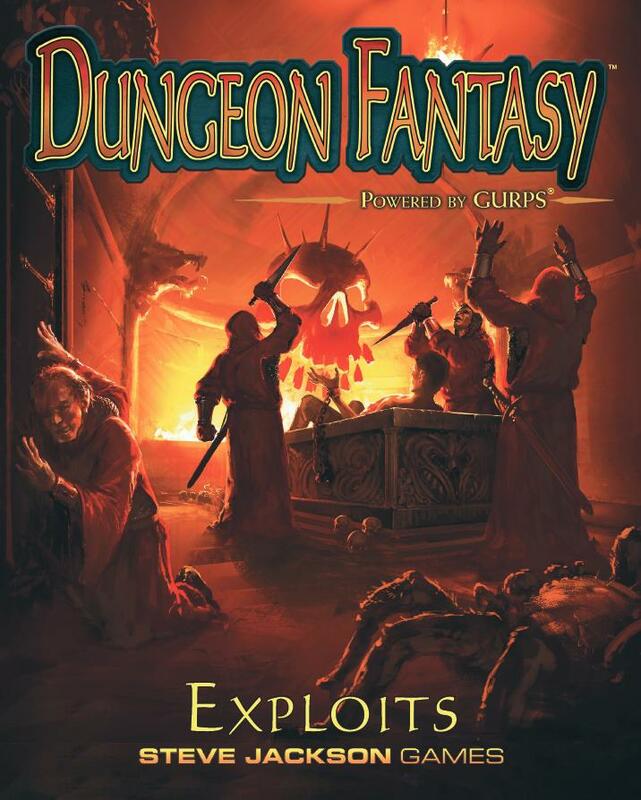 Dungeon Fantasy RPG only covers fighting on a map with hexagons, but for players who might prefer a more abstract approach because they don't like maps for any number of valid reasons, can get the free GURPS Lite book from Warehouse23 that covers the basic combat system. The chapter is extremely detailed; it's the longest one in the book. I feel like it might have been better organized to include the more common rules first, and the detailed advanced rules later on. It mixes for example, the rules on normal parrying with rules about parrying flails and kusari, which are somewhat rare occurrences. On the other hand, this organization probably better suits an old hand that is reading through the book, not to learn how the combat system works, but to reference something quickly, in which case, the organization makes more sense. I, of course, enjoy the GURPS combat system, and I don't have much unique to add about this chapter, but for more details, you can check my review on GURPS Basic Set - Campaigns, and Dungeon Fantasy 2. This chapter deals with injuries, illness, and other maledictions that can afflict delvers, how they impact the party, and how to deal with them. The organization of the chapter is sensible, and goes from the most common issues to the less common in a way that a reader can follow easily. Some trap specifications are at the end of the chapter, which seems a little strange to me, like they might have been better relegated to an appendix, but it's not especially out of place when talking about traps. This chapter includes guidance for GMs to distribute wealth, and for players to disseminate it. It talks about skills to look for it, to analyze it, negotiate good deals, and some prices on a few typical treasures, like gold coins, or a handful of included enchantments. The catalog of enchantments and the rules for identifying treasure are pretty good, but the advice on stocking treasures feels a bit vague still. Some parts of GMing can't be relegated solely to formulas and rolls of the dice, apparently, and you'll be asked to feel around in the dark until you learn how much treasure is too much or not enough. This is the GM's advice chapter, telling how to administrate, create, run, and have a good game of Dungeon Fantasy RPG. It has advice on how to design cohesive dungeons, how to award character points at the end of a session, keeping a good pace, exercising character's niches, and other things. The advice is mostly subjective, but also, I agree with most of it as well, and think it is a good resource for new GMs getting the hang of things, or old GMs trying to refresh their memories. This is a book that I have kinda imagined a long time ago would be a great introduction to GURPS, and I think it is absolutely as good as I imagined it could be. The example play is a bit short, but an interesting inclusion. I see a lot of them in books for other systems. I think it might have been better to spread the examples through the book though, as vignettes or asides demonstrating some of the more difficult mechanics. Overall, this is a good book for new gamers for Dungeon Fantasy RPG or even GURPS proper, but for long time players, unless you really dig the swell publishing quality, it might be redundant if you already own both GURPS Basic Set - Campaigns and Dungeon Fantasy 2, although there are a handful of interesting simplifications you might want to take a look at as well.